Because electroencephalography (EEG) forms the backbone of much of my neuroscientific research, during my first and second years of graduate school I studied a lot about the history and nature of EEG recording and EEG signals. This research is what lead me to Hans Berger, the inventor of EEG. There is an excellent historical treatment of Hans Berger by David Millett published in Perspectives in Biology and Medicine where a lot of this information comes from. But Berger's story is so interesting that I wanted to tell a little piece of it here. Currently I'm interested in the role that neuronal oscillations play in cognition, so EEG tends to be my research method of choice when I do any neuroimaging. (For a more in-depth treatment of what the EEG signals mean, check out the Scholarpedia entry or my more brief explanation). My research involves work with normal, non-invasive (that is, not surgical) scalp EEG as well as invasive EEG (referred to variously as iEEG, ECoG, or ICE). (For an explanation as to why someone might get electrodes surgically implanted into their brains, check out this part of one of my talks). What does all this have to do with Berger? Well that starts with why Berger was trying to record electrical signals from the brain at all. It turns out, Berger was a big believer in psychic phenomena: namely telepathy. He believed that there was an underlying physical basis for mental phenomena, and that these mental processes—being physical in nature—could be transmitted between people. Thus, in order to show that psychic phenomena exist, Berger sought to show the nature of the underlying physical processes of thoughts and emotions. He initially studied blood flow and used it as an index to measure "P-energy" (psychic energy) associated with mentation and feelings. Of course, this being prior to the advent of neuroimaging, there was no way to actually measure cerebral blood flow from a person. So Berger made a leap. The brain receives so much blood from the heart (about 20% of the cardiac output), that the brain pulses with each heartbeat (you can check out a video of the human brain pulsing here). Parents with newborns might even be able to notice this phenomenon if they lightly touch the soft spot at the top of their baby's head. ...only when the two clay electrodes were placed 4 cm apart in the vicinity of a scar running vertically from above downwards through the middle of the enlarged trephine opening, was it possible with large magnifications to obtain continuous oscillations of the galvanometer string. Very early on Berger noticed that there are fairly regular brain oscillations, such as the one seen below, in the human EEG (the top trace is the EEG, the bottom is a constant 10Hz timing signal). These oscillations are very strong and can be seen in the ongoing EEG activity in many people quite clearly. Working with these patients gave us a unique opportunity as cognitive neuroscientists... One of the things about EEG is that you can't accurately locate where in the brain something is happening, but you can know when it happens with excellent accuracy. However, because these patients literally have a window onto the brain we can get a much better idea of where the signal we're recording is coming from. One of my favorite anecdotes that my advisor told me when we first started this study was that when he was doing EEG in the 1970s on people who had previously had brain surgery, he noticed that the signals from any electrodes over the small holes in their skulls were abnormally large. So he would just move the electrodes off those sites to avoid this "artifact" (an observation that he says he's kicking himself for not taking advantage of 30 years sooner). Or, as Wired amusingly quoted him as saying, the signals, "looked really weird because they were freakishly strong". So the only reason Berger saw the EEG signal in the first place was because he was working with the same patients he was trying to record brain pulsations from. And the only reason he was interested in these brain pulsations was to try and tie cerebral activity (blood flow) to mental states to show that thoughts have a physical basis. And the main reason he cared about that was to provide a theoretical framework through which psychic phenomena could operate! Thus, I owe a good part of my career to Dr. Hans Berger and his unfailing effort to prove telepathy. 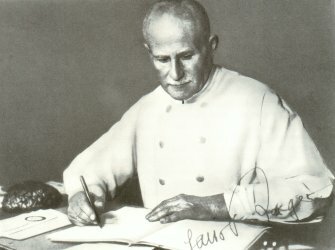 And my work with people who had a surgical hemicraniectomy to better allow us to perform cognitive neuroscience and brain-computer interfacing experiments was published almost 100 years after Berger was recording from the very same types of patients! What an awesome scientific lineage to follow. I would like to draw your attention to some other aspect of Berger's biography. It will not diminish his achievements in the field of EEG, but it will provide a more complete picture on his life. The information that I am refering to is gained from a book called "The other brain" fron Douglas Fields. It is available on google (pages 147ff, just search for 'Berger' on the page). If you are interested in additional information, the researcher who investigated his life more fully is called Susanne B. Zimmermann. She also gets a mention in Fields' book. Sadly there are no previews available for that page online, but I'll take a look at it next time I'm in a bookstore. And I've already begun tracking down Dr. Zimmermann's writings on the topic. VERY cool -- I love when scientists (whom many of us think of as types who will only be persuaded by cold hard and logical facts) delve into the things they cannot see, but which they believe are real nonetheless. You should take a look at a film (documentary) probing scientific evidence behind psychic phenomena - "Something Unknown ... is doing we don't know what." It provides scientific evidence behind psychic phenomena and shows scientific experiments that show a connection between the mind and the mind, the mind and the body, and the mind and the world. The film shows how psychic power is a part of our inherent nature. Discovering meaning and purpose in our lives deepens the life experience. Thanks for the link. I'll try and check out the film. Berger's story definitely caught my eye when I first came across it. He was a very interesting guy. really interesting work and great article on berger. watching the video of your lecture i was wondering http://mitworld.mit.edu/video/342 24 minuets into this video Mr.Shulgin talks about brain scans taken of some schizophernic patient. one the patient came back a few weeks later and actually picks out his own brain scan because he sees a shape in the scan that he sees in his vision all the time i was wondering if you came across anything like this in any of your study. thank for your time and work.